We are seeing the beginning of first generation European corn borer (ECB) moth flight in eastern Nebraska. Non-Bt corn above 16 inches in extended leaf height should be scouted. We expect populations to peak in the next two weeks. Although we generally have not seen high corn borer moth flights in Nebraska over the last few years, there is always the possibility of damage in some fields. Fields most at risk include early planted fields of non-Bt hybrids. 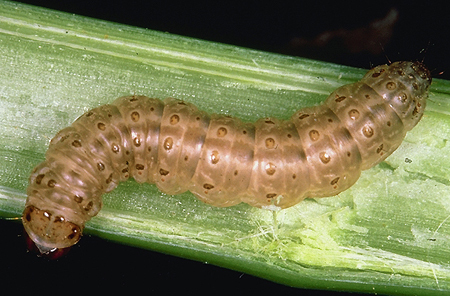 Corn borer larval survival depends on several factors. High humidity and warm temperatures are ideal for establishment of larvae in the whorl. Egg masses are white, with 5 to 40 eggs in each mass, and laid on the underside of leaves near the midrib. The masses look like fish scales flattened against the leaf. In four to seven days the heads of the developing larvae will be visible, and the eggs will appear spotted. This is the "blackhead" stage, and these eggs normally hatch within 24 hours. As the larvae enter the whorl to feed on the developing tissue, the feeding scars (shot-holes) appear as the leaves emerge from the whorl. Larvae will remain within the whorl for 7 to 14 days before boring into the stalk. Corn that is less than 16 inches with extended leaf height (distance from the ground to the tip of the leaf pulled up vertically, about six-leaf stage) is unlikely to support young larvae because of the presence of a substance known as DIMBOA, a natural resistance factor. As the plants grow, the level of DIMBOA decreases, so plants above the 16-inch extended leaf height will generally support corn borers. 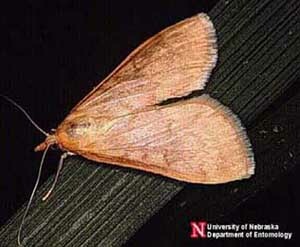 The UNL Department of Entomology has updated information on European corn borer moth flights. Light trap data is now available online for Clay Center, Concord and North Platte. This data can help determine when to scout for different caterpillar pests. Although you cannot determine the need to treat individual fields based on this information, light traps help monitor the seasonal development of these pests. Timely and accurate scouting is the key to managing European corn borer in standard (non-Bt) corn hybrids. Fields should be scouted over the next couple of weeks as corn borer egg-laying and larval hatch begin. Remember that conditions are localized and each field should be scouted to make accurate decisions. First generation corn borers prefer taller plants for egg laying, therefore, the earliest planted fields are more likely to have higher populations. Scout these fields first, but do not neglect other fields because any cornfield is a potential target and should be scouted. When corn borer larvae begin to feed in the whorl they produce small holes in the leaves from feeding within the developing whorls. As the whorl leaves emerge, this feeding produces rows of small shot holes across the leaf. To scout for corn borer larvae, examine 50-100 plants in a field, stopping at several places in the field. Count the number of plants with shot-hole damage, and at each location pull the whorl from 1-2 damaged plants, carefully examining it for live corn borer larvae. Record this information. To determine the need for treatment, scout at least 20-25 consecutive plants in at least four to five places in the field (100 plants minimum per field). The scouting locations should be randomly selected and representative of the field as a whole. At each location, randomly select the first plant to be sampled. If you always start sampling at an infested plant, the counts may be inflated by as much as 5%. Count the number of plants showing shot-hole feeding and determine the percent of infested plants. Pull the whorls from at least two randomly selected infested plants in each set of 20-25 plants. Unroll the leaves and count the number of larvae in the whorl and determine the number of larvae per infested plant. Now that Bt corn is being planted widely, be sure you know whether the field you are scouting was planted to Bt corn. In Bt corn, corn borer injury to whorl stage plants should be limited to a few tiny pin-holes where larvae initially fed before ingesting a lethal dose of Bt toxin. However, seed lots may contain a small percentage of off-type seed (typically less than 4%) which does not produce sufficient toxin levels to kill corn borer larvae. If more than 4% of plants show significant leaf feeding damage in a Bt cornfield, check to confirm it is corn borer causing the injury. Bt corn hybrids may reduce but not completely control other caterpillars such as corn earworms or common stalk borer. If you believe that corn borer is causing the injury, contact a representative of the company that sold the seed to investigate the situation more completely. Average percentage of damaged whorls in the field and average number of live worms per damaged plant. These numbers help provide an estimate of the possible maximum number of cavities per plant at the end of the first generation. Cost per acre of the insecticide application (product and application costs). Anticipated dollar value of the grain per bushel. Estimated percentage control given by a particular insecticide. Compare the preventable loss to the total cost of insecticide application. An insecticide application is economically justified if preventable loss exceeds the total cost of insecticide application. For example: An average of one borer cavity per plant is capable of causing 5% yield loss. Using the worksheet example, it is known from scouting that 50% of the plant whorls are damaged with an average of one live borer per damaged plant. Calculate that 50% x 1.0 = 0.5 borer per plant, if all survive. Assume 75% control and $6.00 value per bushel of corn with a yield expectation of 200 bushels per acre. To estimate the cost/benefits of applying an insecticide for European corn borers, you also need to know the cost per acre of the insecticide application ($/acre), the anticipated price of grain ($/bu), and yield potential (bu/acre) of your hybrid. Assume 5% yield loss/borer/plant and a proportion of larval population reduction by insecticide application of 0.75. An interactive version of this worksheet is available. Dollar loss per acre (5 bu/ac x $6/bu = $30 loss/ac). 7. Compare preventable loss Subtract treatment cost ($12.00/ac) from preventable cost ($22.50/ac) to find dollars saved by treatment per acre ($10.50/ac). If preventable loss (No. 5) exceeds total cost of treatment (No. 6), you may benefit from an insecticide application for first generation corn borer. As with most control options, timing of the application relative to crop and pest development is important to treatment effectiveness. Insecticide treatments for European corn borer will be effective only if borers are still feeding in the whorl. Treatments made after corn borers bore into the stalk will not be effective. Based on research data, the best control is achieved with aerial or ground-applied granular formulations or liquid applications through sprinkler irrigation systems, which provide the best penetration of insecticide into the whorl where the corn borer larvae feed. Careful scouting and appropriate timing also allow growers to take advantage of this pest's natural enemies. Young corn borers usually suffer 60-85% or higher mortality due to natural enemies, weather and disease. Delaying treatment decisions until most of the borers are second instar will allow growers to take advantage of natural larval mortality. Common stalk borers will be moving into corn from nearby grassy areas and damage will soon be visible. At first, large shotholes can be seen, and later, as the stalk borers burrow into the plant, the plant looks very ragged and stunted. Common stalk borer damage is occasionally confused with corn borer damage, but is nearly always confined to a few rows that border grassy areas. The larva is pale white, with dark brown to purplish stripes that converge to form a saddle shape along the middle of the body. Once the larvae have entered the stalks, there is no control available. Many insecticides are registered for control of first generation European corn borers and most will do a good job if applied properly at the right time. The Bt-based insecticides Dipel, Condor, M-Peril and others are effective and do not reduce populations of corn borer natural enemies. Refer to the UNL Department of Entomology Web site for a list of suggested insecticides. Because of the high value of corn, a relatively low level of corn borers may cause economic damage that would pay you to treat. Remember though that it takes a minimum number of corn borers to affect yield. Generally, you would need an average of more than one corn borer per plant to reduce yield. Even lowering that threshold to 1 borer per plant could save unnecessary application. In fields meant to be a refuge for Bt corn active against European corn borer, you cannot spray a Bt liquid or granular insecticide for control of corn borers. The purpose of the refuge is to produce Bt-susceptible corn borer moths that can mate with moths emerging from the Bt corn field. Spraying a Bt product on the refuge would defeat the purpose of the refuge which is to delay resistance development in the corn borer population.